The U.S. military's STACKSAT mission involved the launch of three similar technology spacecraft, POGS & SSR, TEX and SCE. The satellites, based on DSI's Maestro bus, are gravity gradient stabilized. Body mounted solar arrays provide ~15 W orbit average power. Originally the mission was to consist of only two spacecraft and to be launched on a Scout-G1 booster. As all available Scout launchers in the inventory had already been assigned to other missions, an Atlas-E rocket became available. This rocket, which could not be used for any other msission due to a lower than normal thrust of one of its engines, was fitted with the Altair-3A (Star-20A) upper stage inherited from the original Scout launch vehicle. 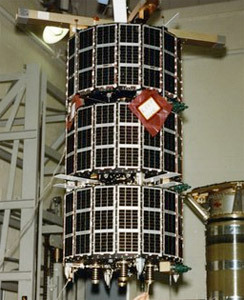 The resulting Atlas-E Altair-3A combination had a higher performance than the Scout, so that a third satellite could be added. POGS & SSR (Polar Orbiting Geomagnetic Survey & Solid State Recorder) was designed to measure the Earth's magnetic field vector as a function of position. Data from the experiment was used to improve Earth navigation systems, and was stored in an experimental solid state recorder. It carried a magnetometer to accurately map the Earth's magnetic field for the Defense Mapping Agency. Data was stored in a new Fairchild solid state recorder. TEX (Transceiver EXperiment) carried a variable power transmitter used to study ionospheric effects on RF transmissions. Data from the experiment was used to determine minimum spacecraft transmitter power levels for transmission to ground receivers. SCE (Selective Communications Experiment) carried a variable frequency transmitter to study ionospheric effects at various RF frequencies, and was also designed to demonstrate message store and forward techniques. Six low cost ground stations were designed, built and located around the world to operate these spacecraft. Also on board of this launch was an experimental Prototype Deployment Device (PDD).